A few months back I was on a huge poached egg kick. I mean HUGE. For awhile there I was eating them every single morning for breakfast. Summer came, my boys have been home, and my poached egg craze slowed down. Now I find myself craving them again. 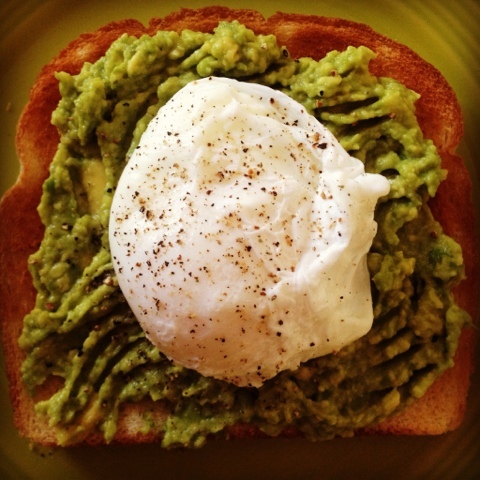 My absolute favorite way to eat poached eggs is on top of avocado toast. Lightly toasted and crunchy fresh bread, creamy and delicious smashed avocado, a perfectly poached egg, and a sprinkle of salt and pepper on top. Pure perfection. Fill a small pot about halfway full with cold water and bring it to a boil over medium heat. The key is to make sure your water is at a slow boil, not roaring bowl. When tiny bubbles are forming at the bottom of your pan you know the water is ready. Add a tablespoon of white vinegar to the water and whisk it well. Crack the egg into a small bowl first, then slowly slide it into the water. Immediately take the end of a wooden spoon and gently make circles around the egg. It helps keep the round shape and prevents all the white strands. Cook the egg for three minutes for a runny yolk, a minute or two longer if you want it cooked more. Remove with a slotted spoon to a paper towel lined plate to remove excess water. While your water is boiling take a ripe avocado and slice it in half. Scoop out one half and in a bowl smash it with a fork into small chunks and sprinkle with salt and pepper. Set aside. Wrap the other avocado half tightly in plastic wrap, with the pit still intact, and refrigerate for another use. Once your egg starts cooking, pop your favorite piece of bread in the toaster. Once it's done, slather it with the smashed avocado. When your poached egg is ready place it on top of the avocado toast and sprinkle with salt and pepper. You can also drizzle it with hot sauce or sriracha if you like a little kick.